Things that smell: rotten eggs, farts, …Neptune’s neighbor? 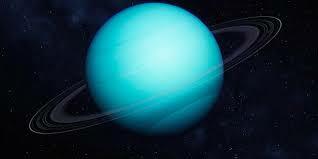 Uranus is one of our solar system’s gas planets. Made of liquid and gas, unlike Earth, it has no solid surface. We know very little about it, partly because it’s almost three billion miles away. Patrick Irwin and other researchers scoped out Uranus with the Gemini North telescope in Hawaii. They analyzed the infrared light coming from the planet. It’s the same kind of light detected in night vision goggles. What did they find? Hydrogen sulfide or. . . FART GASES. That’s right: hydrogen sulfide is what makes our flatulence smelly. More seriously, Uranus’s atmosphere can tell us about its history and how planets formed. For example, Uranus may be younger than Jupiter since it’s further from the sun. That extra distance means it probably had fewer planet-making ingredients, like solar dust and gas. The researchers will test this idea by having a spacecraft measure AMOUNTS of Uranus’s gases. As long as I’m not going. Maybe Uranus is a fitting name for that planet after all. Sorry!